Last edited by Heather L on Mon Jan 14, 2019 9:24 pm, edited 1 time in total. My scaps are in order as they happened the times of cam 1 and cam 2 are out of sync. Good early morning NE FL , Philjo, Heather and everyone ! Good morning everyone, bonjour Bev, Heather, … ! jd_AEF (Moderator): Good morning Hamlet! Today's forecast is for partly cloudy skies, temps upper 40's increasing to mid 50's through the afternoon. Winds 5-10 mph. Please join us for chat tonight 6 pm - 8 pm EST. jd_AEF (Moderator): All is quiet in the Hamlet this morning except for occasional vocal greetings between A2 and Samson and a barred owl hooting in the distance. leigh_AEF (Moderator): Good morning! 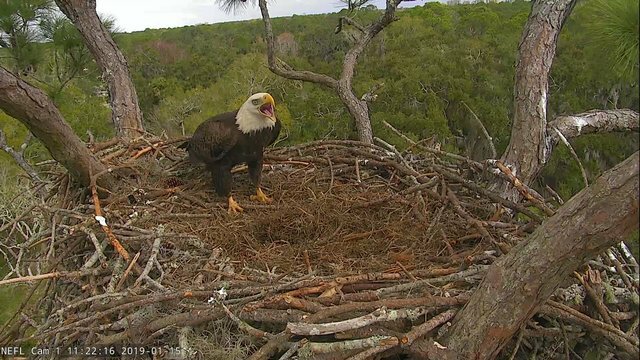 A2 moved to the nest at 7:05 and joins Samson. Samson flew at 7:08 followed by A2. 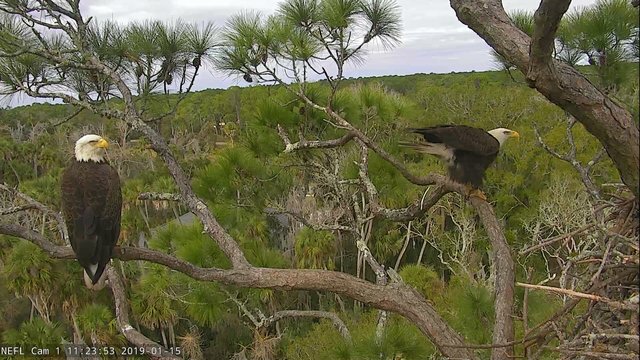 11:20am: According to chat, there are two female eagle visitors to the nest that are not Samson or GF. While I am posting, they are very vocal. cyn_AEF (Admin): The eagle that we were calling "F" is the one that is perched, sorry about that! I lost my scorecard, but my team mates found it for me, lol. After a sort of short stay, she flew around 9:25. Same female returns at 10:15 and is perched on the Sunset branch. Just had a visit by another eagle that was not Samson or his Girlfriend! Each eagle is perched on a Wallenda branch! jd_AEF (Moderator): Here is the requested video of Samson's GF chasing off the sub-adult from the nest early on the morning of January 14th. 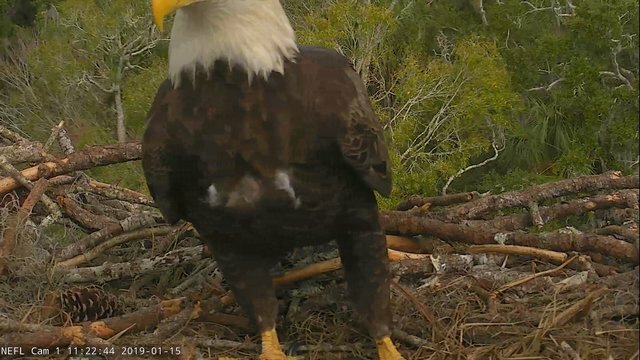 Here is the requested video of Samson's GF chasing off the sub-adult from the nest in the early morning of January 14, 2019.
tweetie_AEF (Moderator): Good afternoon, faithful Hamlet viewers! It has been a quiet afternoon so far, maybe there's a fishing excursion for all the eagles in the area today. Chances are we will see Samson and some friends later.